One of the finest recommendations by my colleague, Yuzu restaurant surprised me with their simplistic-yet-classy decoration and not-your-average-yet-very-tasty Japanese food. 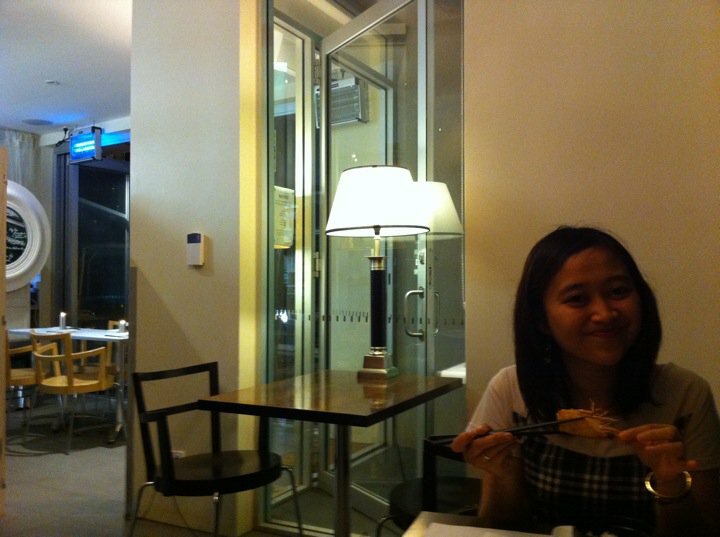 They have a very simple selection of food, which were served according to the season. This review took place in wintertime. Before we start the review, I must warn you that this is not your average dine out restaurant as each dish cost in excess of $15 and ideally each person would order around 3 dishes. Also as usual, please book in advance to avoid disappointment. Similar to Tetsuya’s style, Yuzu served a combination of French-style Japanese cuisine. The dishes came in a degustation-style plate. 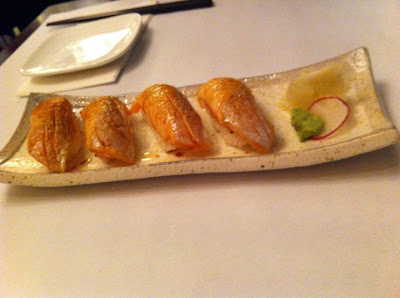 First dish that came out was the Aburi Salmon Sushi. We were not given soy sauce for the Sushi because the Salmon were already pre-soaked in the sauce before they aburi (seared with blow torch) them. It’s definitely one of the better sushi that I’ve tasted, since I couldn’t really differentiate between great and excellent sushi. For the second plate, we had Shiitake Tempura. Judging by its presentation, it’s the least interesting dish of the night but it packed a few surprises. Firstly was its accompanying green tea salt. 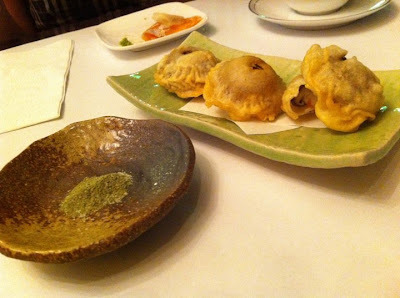 Then, inside the tempura, there was also stuffed beef. The green tea salt accentuated the shiitake and beef flavour. Next one on was Deep Fried King Prawns. I must say that the picture did not justify how big the prawns were. 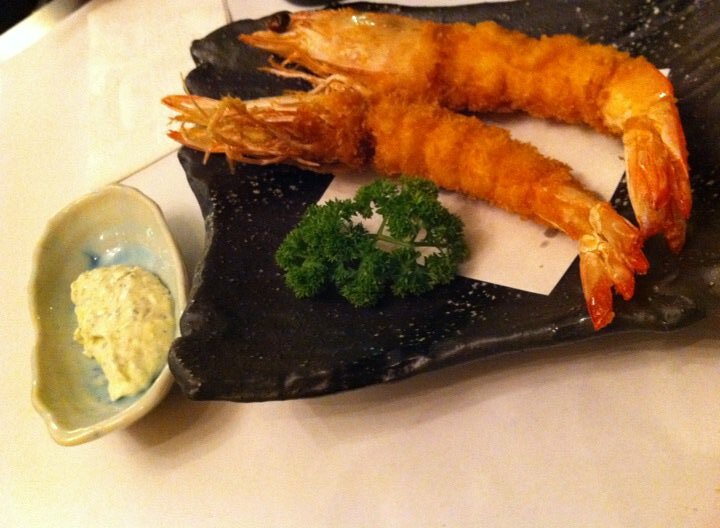 In addition to its size, the prawns were also very crunchy and golden brown. The green tartare sauce added a whole new dimension to their flavour. Our main dish of the night is Alfoncino Nimono. According to Wikipedia, Alfoncino is a pretty rare red fish that are found in deepwater of a temperate ocean. Nimono is a kind of Japanese simmering technique that can also mean boil and season. The fish was cooked perfectly but yet still retain its juiciness. 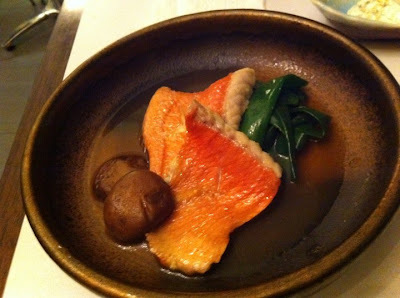 The nimono technique drew out sweet flavour from the fish and the shiitake with green vegetables were complementing the fish. Last but (definitely) not least is the drink, the Yuzu tea. This drink is the best non-alcoholic drink I have ever tasted. 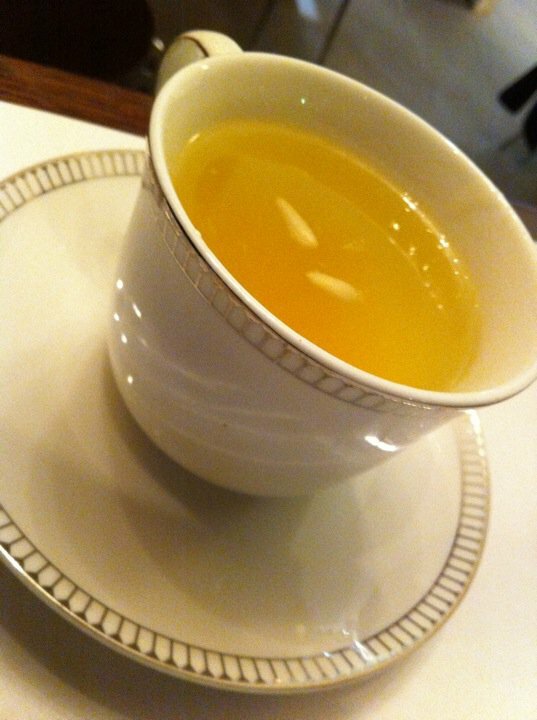 It looked like a lemon tea, but instead of lemon, they put Yuzu’s (which is a kind of Citrus fruit) zest and peel. It tasted very sweet with a hint of bitterness, but at the same time very refreshing. Again, it’s not our regular cup of tea and unfortunately they don’t do refill. Pyrmont is the home of some of Sydney’s famous places. The Sydney’s Fish Market is a place to be if you want good, fresh seafood. It’s also cheaper to buy the fish here. Star City casino is also located in this suburb. The casino has a one-hat restaurant, Lyrics theatre, and several other entertainments.